October is my favourite month for obvious reasons. It’s my birthday month and it’s the colder season which means wooly knits, lighting a dozen candles and sipping on chai latte’s. Hell yes! It’s also not long till Christmas festivities begin too – I’m so excited to watch elf and start christmas shopping! Reflecting back on September – which has been a whirlwind but exciting month. A lot has happened, big things have happened (to me and Joe) which were kind of unexpected and a bit out of the blue. I also finally feel like myself again. I feel like I achieved a few things off my goals list this month just gone. I have been a bit more consistent on Instagram (I have a love-hate relationship with the gram though), I’ve been continuing to write blog posts in advance – I’ve had a few spare weekends in September so this has helped massively. I planned something for mine and Joe’s seven year anniversary (which has now already happened) and booked a spontaneous last minute trip to Santorini. AND, I made energy balls for the first time! My weight and slimming world diet has been a bit all over the place if I’m being honest – need to get back on it! As well as return to the gym (kind of dreading going back). I also really want to do some charity work at weekends, but this will have to be on hold for a little while. For October’s goals, I’m not setting myself too many as I have quite a few new things happening this month as well as it being my birthday month. So, I’m being kind to myself and having a fairly relaxing month. Are you setting any goals this month? If so, let me know what they are in the comments below. Follow me on Instagram: @zoeyoliviablog to see what I get up to daily. You can also reach me on twitter: @zoeyoliviablog. Or, if you like Bloglovin’, I’m relatively new to it but follow me on there. I love making goals for myself each month, too. Sounds like you have a lot of exciting stuff coming your way. Congrats on starting a new job! The calendar in your photo is gorgeous, btw! 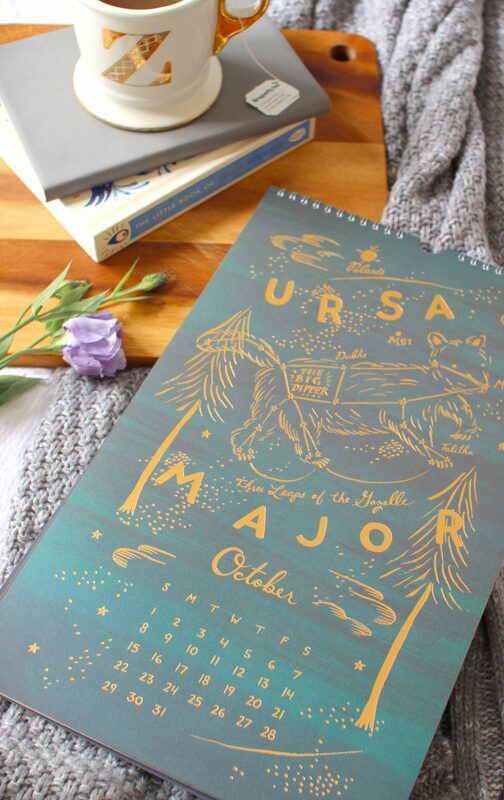 I’m so in love with the look of that calendar! HTML and CSS can be tricky but I imagine they must be quite fun to learn, wishing you the best of luck on the courses! Just stumbled upon your blog and I think you have great content, a really lovely blog! I’d love if we can follow each other on Bloglovin maybe? Do let me know <3 have a nice weekend!